TORNA EL TERROR MÉS AUTENTIC DE SANT ADRIÀ. 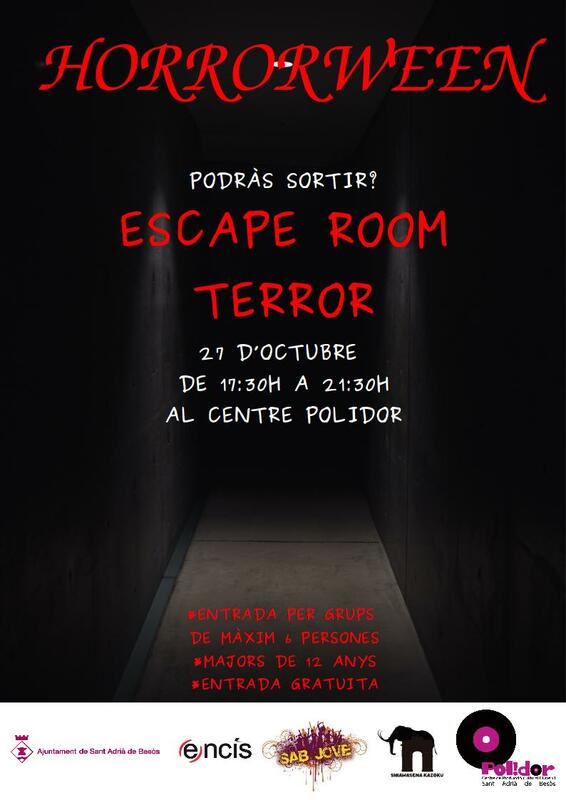 EL JA FAMÓS TUNEL DEL TERROR DEL BESÒS I LA SEVA CITA ANUAL. 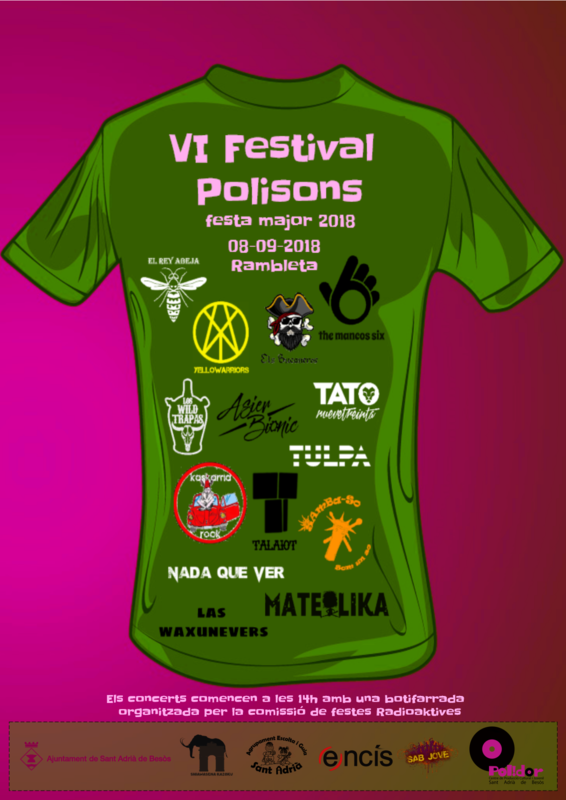 NO T´HO POTS PERDRE!!! 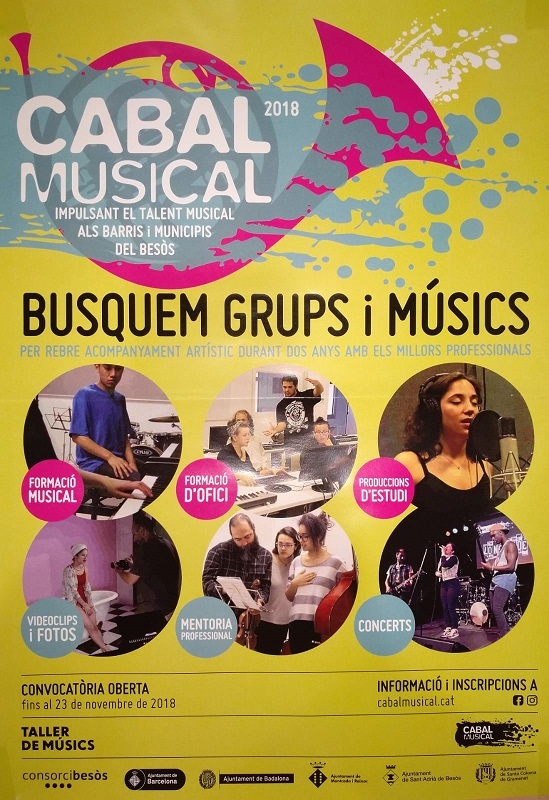 PARTICIPAR AL PROJECTE CABAL MUSICAL. AL CENTRE DE PRODUCCIÓ CULTURAL I JUVENIL POLIDOR. JA HEM ARRIBAT A LA SISENA EDICIÓ D'AQUESTA JORNADA QUE ES VA ESTRENAR AL 2013 I ES MANTÉ MÉS VIVA QUE MAI. 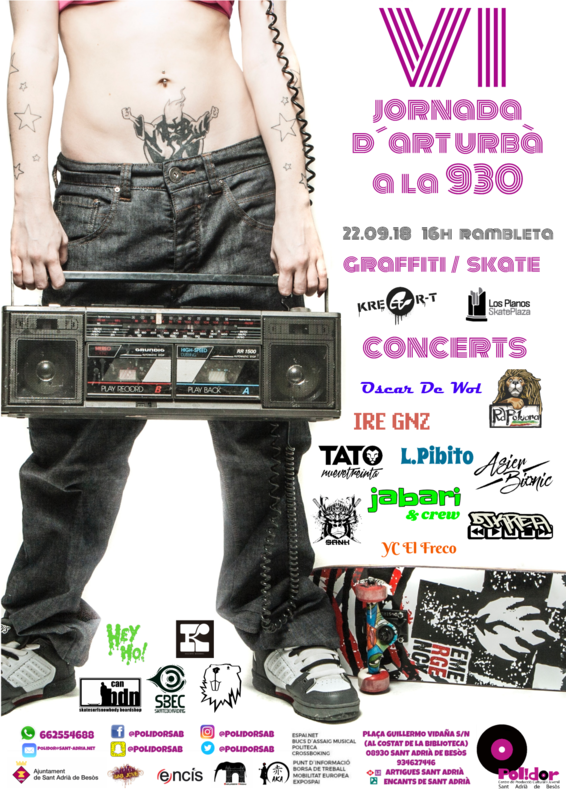 US ESPEREM AQUEST DISSABTE A PARTIR DE LES 16h A LA RAMBLETA PER GAUDIR AMB CONCERTS, PINTADA DE GRAFITTIS, TALLERS I EXHIBICIONS D'SKATE, RAP, REGGAE, DJ'S. SI T'AGRADA LA CULTURA URBANA AL POLIDOR TROBARÀS EL TEU LLOC. UN ANY MÉS L'AKIHABARA ATERRA A LA NOSTRA CIUTAT, CONCRETAMENT AL POLIDOR I AL POLISPORTIU RICART. COM JA FA 4 ANYS, EL POLIDOR US PORTA L´AKIHABARA@DEEP, UN ESDEVENIMENT QUE UNEIX EL MILLOR DE LA CULTURA JAPONESA I EL MÓN OTAKU. 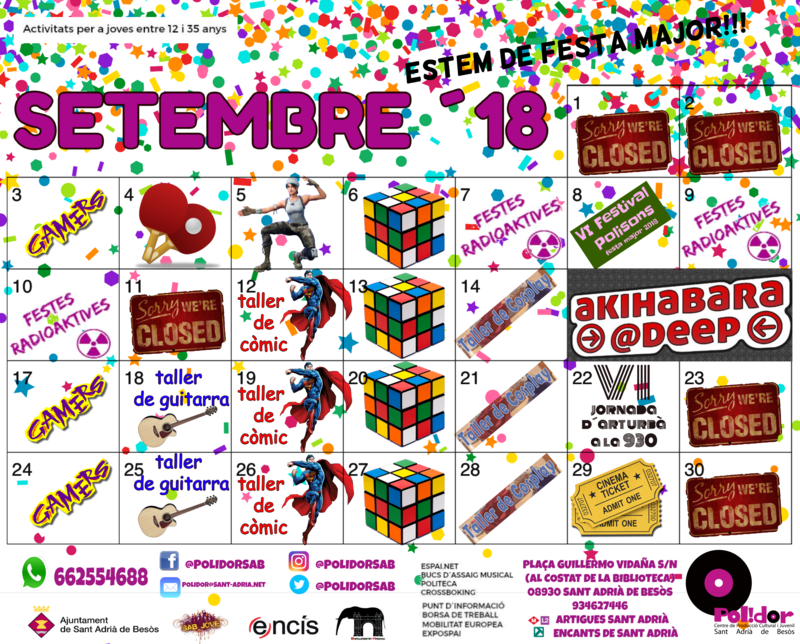 DURANT EL CAP DE SETMANA 15 i 16 DE SETEMBRE PODRÀS GAUDIR DE TOT TIPUS D´ACTIVITATS GRATUÏTES D´OCI I CULTURA AL COMPLEX ESPORTIU RICART I AL CENTRE POLIDOR. ENMARCAT ALS ACTES DE FESTA MAJOR, LA VI EDICIÓ DEL FESTIVAL POLISONS COMPTARÀ AMB L'ACTUACIÓ DE BANDES I MÚSICS DE SANT ADRIÀ, I UN CONCERT FINAL AMB ACTUACIONS DE LUXE. ARRIBA POTSER, EL MES MÉS FORT DEL 2018 AL POLIDOR. 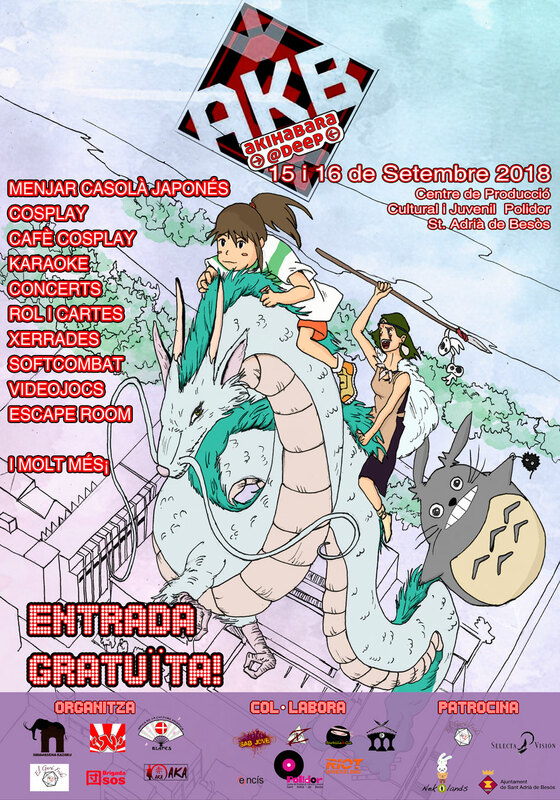 A LES ACTIVITATS HABITUALS, SUMAREM LES FESTES RADIOAKTIVES, EL FESTIVAL POLISONS, L´AKIHABARA I LA VI JORNADA D´ART URBÀ QUE ES VA SUSPENDRE AL JULIOL. I SOBRETOT.....LA FESTA MAJOR!!!! 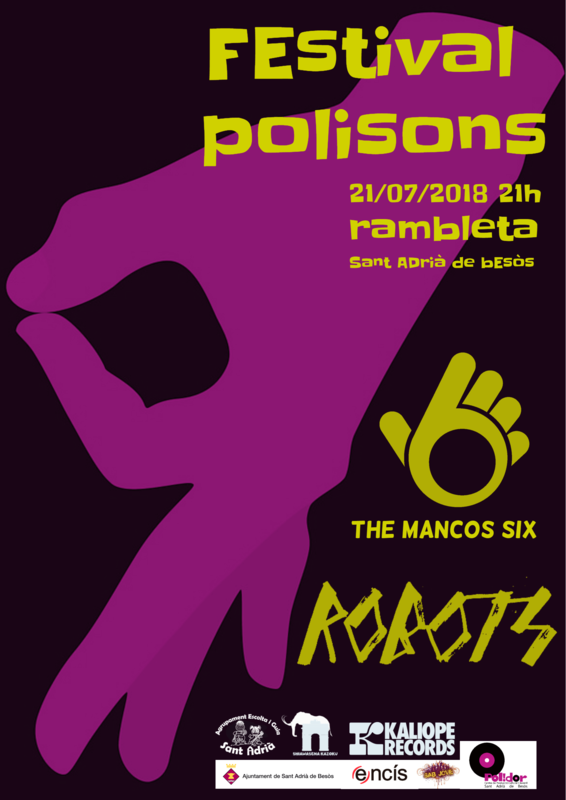 SERÀ AQUEST DISSABTE QUAN TINDREM L´EDICIÓ DE JULIOL DEL FESTIVAL POLISONS 2018, AMB ELS CONCERTS DE "THE MANCOS SIX" I "ROBOTS". 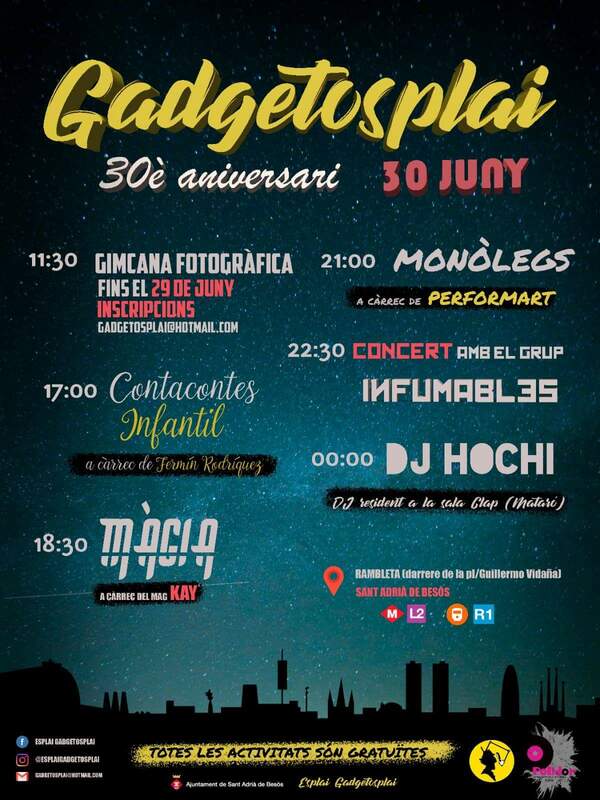 AQUEST DISSABTE, A LA RAMBLETA, A PARTIR DE LES 17h, ARRIBA LA GRAN FESTA DEL 30è ANIVERSARI DEL CENTRE D'ESPLAI GADGETOSPLAI, UN MÓN D'ACTIVITATS US ESPEREN!! 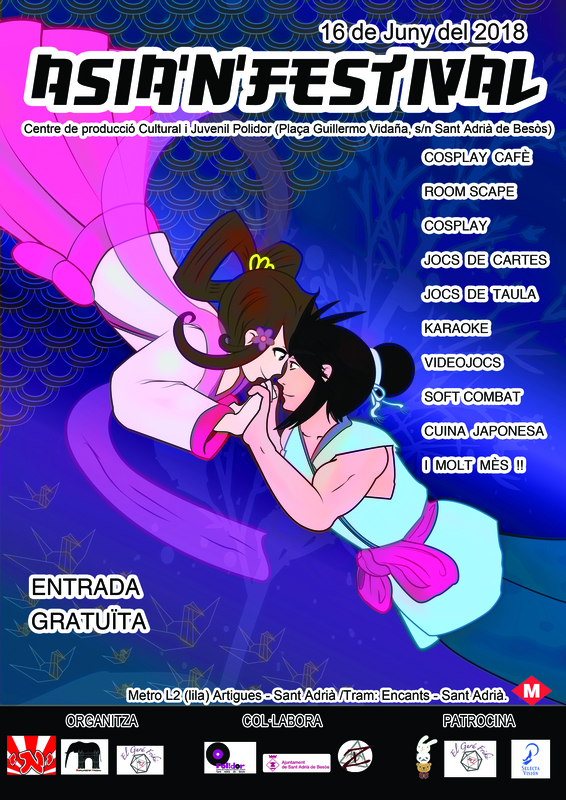 ASIA'N FESTIVAL AL POLIDOR EL DISSABTE DIA 16 DE JUNY!! L'ASIA'N FESTIVAL ÉS L'ESDEVENIMENT DE CULTURA DISPERSA I OCI ALTERNATIU DE L'ESTIU A CATALUNYA, QUE COMPTARÀ AQUEST ANY AMB SORPRESES MOLT GRANS.